On Friday, we visited the Willie Creek Pearl Farm. We could have paid for a tour that included a ride in and air-conditioned coach, but we decided we would drive ourselves in our own air-conditioned car. 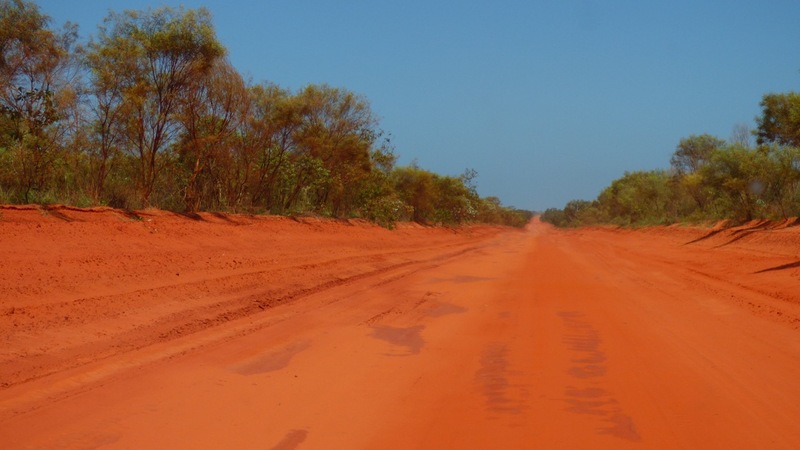 Getting there was easy enough, the farm is located 38 kilometres north of Broome (23.1 miles), with the last 14 kilometres along what turned out to be a very red, very well graded, dirt road (8.1 miles). As dirt roads go, it was rather smooth and we were informed it had been freshly graded only two days previous. I can’t get over the colour of the dirt here in the Kimberley. Granted, this was not the first red dirt we’ve seen in Western Australia, the sand was a similar colour in Francois Peron National Park. But this was a much deeper hue, and worth a special mention. Yea! You brought home a pearl! This photo is neat because of how red the dirt is. Even living in Arizona where there is a lot of red dirt… This is a lot in one area. The red dirt here goes on forever! The Kimberley is a very large region and so far we’ve covered only one small section and seen very little dirt of any other colour. My one precious (Kimberley) pearl is a treasure for our 30th wedding anniversary in October, and I don’t even care that I know what Dean is going to give me.